Senator Buruji Kashamu, has withdrawn a N20.1bn libel suit he instituted against former President Olusegun Obasanjo before a FederalCAPITAL Territory court in Abuja. The presiding judge, Justice Valentine Ashi, struck out the suit on May 26, 2015,FOLLOWING THE notice of discontinuance of the suit filed by the plaintiff. Kashamu had on February 6, 2014, sued Obasanjo for “maliciously and recklessly” publishing a letter titled, ‘Before it is too late,’ADDRESSED to former President Goodluck Jonathan in December 2013. He had asked the court to award him N20bn as aggravated and exemplary damages, and another N100m against Obasanjo for maliciously portraying him as a fugitive wanted for drug- related offences in the United States of America. In related development, Policemen from Zone 2 command, Onikan, Lagos, have arrested two persons who allegedly posed as daughter to former President Olusegun Obasanjo and an intelligence officer respectively, to Senator Buruji Kashamu, with a plan to poison the former President. The suspects identified as Peter Uwakala and Victoria Alaegbu, it was gathered, were arrested following a complaint by Kashamu at Zone 2, last month. The suspects, it was gathered, met with Kashamu at a hotel in Victoria Island, Lagos, on May 8, 2015,where they allegedly called the former presidents unprintable names and offered to poison him. In response to the complaint lodged by Kashamu, the command reportedly swung into action and arrested the suspects. According to a police report obtained by our correspondent: “The fact of the case was that the complainant alleged in his verbal complaint that the duo of Peter Uwakala and Victoria Alaegbu falsely represented themselves as an intelligence officer and daughter to the former President Obasanjo respectively to him under the pretence that they were going to resolve the political rift between him and Obasanjo. “He stressed that the duo met with him at a hotel, where the latter who had collected N500,000 from his younger brother, made some uncomplimentary and derogatory remarks about the former president, while the former introduced herself as Yetunde Obsandjo to him. He added that he had to report to the police upon his suspicion of foul play by the suspects. “Investigation conducted revealed that the duo were impersonators. From the foregoing, it was established that both Peter Uwakala and Victoria Alaegbu actually committed the offences alleged by the complainant and have been charged accordingly in line with the prescription of the law. “The suspects were arraigned before Chief Magistrate Adeola Adedayo at the Igbosere Magistrate Court, Lagos on June 5, 2015 and were remanded at Kirikiri Prisons. The matter was adjourned to July 31, 2015.” It was gathered that Kashamu's gesture of reporting the matter to the police in spite of their political differences made Obasanjo to say he had forgiven Kashamu of any grudge he had against him. 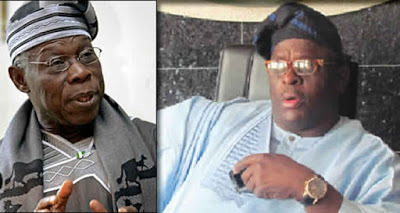 It was gathered that the rapprochement led to Kashamu withdrawing the N20billion libel suit against Obasanjo.